Sub: RMSA - Telanaqana ·· GoI has set up Atal Tinkerinq Laboratories (ATLs) under Atal Innovation Mission (AIM) to promote a culture of innovation and entrepreneurship in India - Copy communicated - Reg. Read:·· Email dated.28-7-2017 of the Mission Director, Atal Innovation Mission, NITI Aayog, Govt of India, New Delhi and copy received in this office on 5-8-2017. While communicating a copy of the Email read above to all the District Educational Officers and all Secretary's of Residential Educational Institutions in the State they are requested to circulate the information about the above scheme to all schools under their control and encourage them to apply throuqh online in prescribed website i.e http://niti.gov.in/contemtlatal-tinkering laboratories, on or before 31-08-2017 without fail as desired by the Government of India and report compliance to this office at once. Further, for guidelines and details they have to visit the above said website. PROCEEDINGS OF THE DIRECTOR, STATE COUNCIL EDUCATIONAL RESEARCH AND TRAINING, TELANGANA, HYDERABAD. Sub:- O/o. SCERT, TS, Hyderabad - GOI - Niti Aayog - Submissions of proposals on Atal Tinkering Labs under Atal Innovation Mission by Secondary Schools in Telangana - Dissemination of Information - Reg. The attention of all the District Educational Officers in the state is invited to the subject cited above, the Government of India has setup the Atal Innovation Mission (AIM) under NITI Aayog to create scientific temper and cultivate the spirit of curiosity and innovation among young minds. It proposes to support establishment of a network of Atal Tinkering Laboratories (ATL) in the schools of the country. It is a work space where young minds can give shape to their ideas through hands on do-it-yourself mode and learn / develop innovation skills. The vision is to 'Cultivate 1 Million children in India as Neoteric innovators'. • Young children will get a chance to work with tools and equipment to understand what, how and why aspects of STEM (Science, Technology, Engineering and Math). ATLs can be established in schools (minimum Grade VI - X) managed by State/ Central Government, Local body (Municipality / Nagar Nigam), Private trusts/society or Tribal/Social welfare department etc. The applicant schools shall be provided financial support in the form of Grant-in-aid for a maximum period of 5 years. a) One time establishment charge of up to Rs. 10.00 lakh would be provided for each ATL in the first year for instruments, prototyping equipment like do-it-yourself kits, 3D printer, electronic tools, etc. b) An amount of Rs. 10.00 lakh would be provided for each ATL over a maximum period of 5 years for operation of ATLs, maintenance of equipment, purchase of consumables, organizing popular science lecture series, innovation events and other scientific activities, competitions and payment of honorariums to the faculty and mentors involved. The applicant schools have to provide at least 1,500 Sq. Ft. of built up space. Applicant schools from hilly / Himalayan and island states, UTs would have to provide at least 1,000 Sq. Ft. of built up space. The existing facilities for meeting rooms and video conferencing among others can be used to supplement the laboratory space. Applicant schools who meet the above criteria and intending to establish ATLs may visit http://www.niti.gov.in to seek further details and to submit their application online to the Atal Innovation Mission, NITI Aayog. The last date for submitting the proposals is up to 31st August, 2017. Therefore the DEOs of all the districts are instructed bestow personal attention and communicate the above information of ATL under Niti Aayog in all Secondary schools of different managements in their jurisdiction, which helps to strengthen the labs and also gives an opportunity to have well equipped labs in the State. Further it is requested to take necessary measures to send the proposals from the eligible schools which meet the criteria set by NITI AAYOG within the stipulated time. 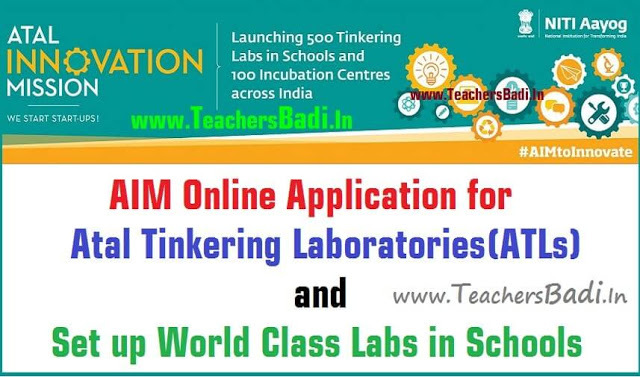 GOI has set up Atal Innovation Mission(AIM) to promote a culture of innovation entrepreneurship in India: A one time grant-in-aid of Rs.10 lakh will be provided for establishing Atal Tinkering Laboratories (ATL) in schools (grades VI-XII) across India. Further, an amount of Rs.10 lakh would also be provided for each Lab over a period of 5 years for operational expenses. Thus, an amount of Rs. 20 lakh per Lab will be spent in each selected school. This will enable young children to work with tools and equipment to understand the concepts of STEM (Science, Technology, Engineering and Math) and also give shape to their creativity. Competitions at regional and national scale will also be organized to showcase the innovations developed by the children. For further details on the scheme, the implementation guidelines may be downloaded from the given below link. NlTI Aayog is seeking applications online from schools desirous of applying under the scheme. The last date of submission of applications is 31st August 2017. This scheme to all your schools and encourage them to apply. Objective: Atal Innovation Mission (AIM) including Self-Employment and Talent Utilization (SETU) is Government of India’s endeavour to promote a culture of innovation and entrepreneurship. Its objective is to serve as a platform for promotion of world-class Innovation Hubs, Grand Challenges, Start-up businesses and other self-employment activities, particularly in technology driven areas. ATL is a work space where young minds can give shape to their ideas through hands on do-it-yourself mode; and learn innovation skills. Young children will get a chance to work with tools and equipment to understand the concepts of STEM (Science, Technology, Engineering and Math). ATL would contain educational and learning ‘do it yourself’ kits and equipment on - science, electronics, robotics, open source microcontroller boards, sensors and 3D printers and computers. Other desirable facilities include meeting rooms and video conferencing facility. Schools (Grade VI – XII) managed by Government, local body or private trusts/society to set up ATL. Schools desirous to establish ATLs may submit their application online to the Atal Innovation Mission, NITI Aayog through the link given below. Apply now for Atal Tinkering labs and set up world class laboratory in your school. For Applying date for ATAL Tinkering Labs Extended up to 31st August . Apply online in NITI Aayog website. It is Central Government scheme to develop Scientific Temper & innovations, in High School children. 20 lakes Financial aid will be given for selected Schools.